I wasn’t sure whether I would talk about this on my blog because I didn’t want to come across as preachy. We all make our own decisions in life and I don’t want to presume to influence yours, however I have been asked to elaborate on being a non-drinker and am happy to do so. I think there are a lot of very normal people out there who are not happy with the way they think about drink. I know I wasn’t. Never in a million years would I have considered myself to have a drinking problem or need to go to AA (I still don't), however I would jokingly say I was concerned at how much I looked forward to a glass of Chardonnay, brandy and dry or g&t when I got home. I also did not like the fact that these drinks helped me keep me just that little bit fatter than I would have liked. This is due to the fact that alcohol is highly calorific being worse than pure sugar, plus you might add mixers (choose your poison – sugar or artificial sweeteners). AND a drink seems to include snacks for me. So I had a love/hate relationship with my cocktail hour. Love the chance to sit down with a magazine or book, hate the fact that my evening drink(s) were making me unproductive with a dumpy figure. It all started a couple of years ago in a conversation with one of our sales reps who was pregnant. She told me she was so glad she had given up smoking a few years earlier, as it would have been harder to do once she found out she was pregnant. I asked her how she did it and she said she read the Allen Carr book which completely cured her instantly and she’d never thought about it since. At the time I remember thinking, I’m sure he has also written a book about dieting, maybe I’ll look it up at the library. When I was doing this, I saw he had another interesting title called ‘No More Hangovers’. I requested them both, and picked them up next time I was in at the library. Even though I initially wanted the diet book, I ended up reading No More Hangovers first. Because it is a tiny book and very simply written, it didn’t take long. A few hours later I remember putting the book down and thinking to myself ‘well, I won’t be drinking alcohol again’. I never dreamed that that would be the case, but at this stage it is. I read the book in May 2012 and haven’t so much as desired a single sip of alcohol since. I don’t really know how this happened and if I ever want to drink again I certainly will, but I just don’t want to. It doesn’t bother me being around other people drinking and I always, always have a few deep sniffs of a good wine and can really appreciate the bouquet. I felt like I had to apologise to my husband for ditching him as a ‘drinking partner’ as we used to enjoy a nice wine together. He says he is fine with it and we have an honest enough relationship that I believe him. He reckons it doesn’t bother him in the slightest that I do not drink and even said it has helped him cut back too which he feels better for. On nights when one of us might have poured a drink out of habit, he doesn’t. Now he only has wine on the weekends (we would have had drinks 3-5 nights per week before) and the occasional cold beer in summer. Last Christmas we holidayed in my native Hawke’s Bay which is very much wine country. I was the happiest person around being the chauffeur showing off our beautiful vineyards while my husband sipped. It really was as much fun for me even though I never tasted a drop. I do miss the taste of my favourite wine varietals don't get me wrong, however I don’t want the feeling that comes with drinking now. I have tried de-alcoholised wine but it doesn’t bear much resemblance at all. So what are my new tipples? If I am in a bar or restaurant after work and want a pick-me-up, for a one-off treat I might order a Red Bull, which I agree isn’t very chic sounding, and I always ask for it to be served in a flute. It is a golden colour and looks just like champagne! In a more casual bar I might order a ginger beer. In Hawaii most bars and restaurants had an alcohol-free beer option – St Pauli and Becks, both German. To me they taste just like normal beer and it’s nice not to feel like a kid with a glass of Coke. I also never feel ‘apart’ from the drinkers if it’s a group of us. Strangely enough I often feel a bit happy along with everyone else later on, as though I’ve had a few drinks. But I’m just getting into the spirit of things! - Diet Coke in a can (I’m not a fan of artificial sweeteners but I don’t want to drink sugar. I buy it in cans so I can have a single portion and it’s always fizzy). 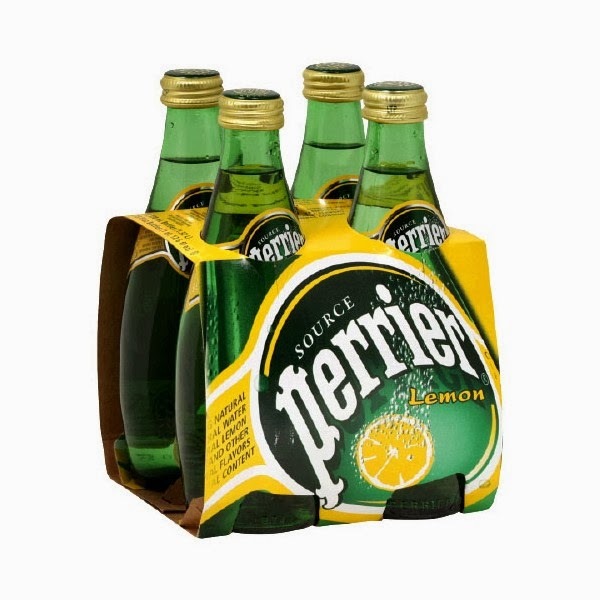 - Mini bottles of Perrier with Lime or Lemon flavouring (expensive but a yummy and stylish treat). I serve both the Diet Coke or Perrier in a flute. It feels more special and I sip it slowly, rather than gulp if it was in a big glass. I heard once that apparently French girls called Diet Coke 'Champagne Noir' which probably gave me the idea, impressionable consumer that I am! - Clausthaler German beer which is 0.5% (classed as alcohol-free) (usually from the bottle on a hot day). I have any of these and now limit my snacks (cheese and crackers or a little bowl of potato chips) to the weekend. We have our dinner earlier on weeknights and the combination of all these things has helped me to become more svelte. Plus I enjoy my dinner much more not having had snacks beforehand. If I am going somewhere I might take a few Clausthaler beers, or for a more formal occasion a large bottle of Perrier to have by itself or mix with sparkling grape juice. Always out of a champagne flute of course. I have had many ask if I am pregnant (no) and look at me strangely (I have learned to live with that). Sometimes I say I am the designated driver, and sometimes that ‘I am on a health kick’ and it seems to satisfy people. Once you turn down a drink most people want you to have one more than ever. Really, I can’t even tell you have good I feel. My body (and mind) is so happy. I dropped 2-4 kg without even trying. I never wake up seedy anymore. At my age even one glass of wine could affect my sleep and have me feeling below par in the morning. And if you have a ‘fun’ night where you ‘let go’, the next day is a guarantee of poor quality eating (at least it was for me) because you feel so rotten. And it’s all down to Allen Carr’s book plus, I suppose, my underlying wish to not be beholden to alcohol. I feel so grateful that alcohol no longer has a pull over me. I never hear it calling my name and can walk past any display at the supermarket. I just know ‘it’s not for me’ anymore and that is my wish, not something I am ‘trying to stick to’. My sister who has two young children, read the No More Hangovers book a month after I did and the same thing happened to her. She is an ecstatic non-drinker now. Like me, she used to worry about how much she looked forward to her evening drink, even if she didn’t drink that much. I’ve probably said enough by now, but if you have any questions I’d be glad to answer them! You are such an inspiration Fiona. Your brave honesty is to be commended. Personally I have cut way back since joining Weight Watchers. On WW everything you eat and drink has points and wine and spirits are high in points. Perrier is my new best friend! Expensive yes but still cheaper than wine. Btw my favourite wine is from the Marlborough area of New Zealand. Oyster Bay. I know exactly how many points are in a glass of wine too - a lot! Oyster Bay is a lovely wine and I'm glad you are flying the NZ flag up there in Canada. Thank you for this post. I feel like you read my mind! Dear Fiona, I don't get much enjoyment from wine anymore. I wonder if it is because of my perimenopausal state. When I do have a glass it is maybe once a month, and I have to confess it is usually because I am thinking it is a "chic" moment for myself. I am basically trying to convince myself that it is something I want - it's crazy! Thank you for reminding us that chic is knowing oneself. I love Anon's comment above mine that "Chic is knowing yourself." And your statement that "Once you turn down a drink most people want you to have one more than ever" made me smile. I don't drink, and most peoples' response is that I just haven't found a drink I like yet. There are enough sweets I like--Buttercream, I love! ♥ :)so I choose to indulge that way instead. I'm happy to read that you found something that works for you. It's fascinating to me how we all evolve and grow and change, even in these seemingly small ways. Fiona can you get San Pellegrino drinks in New Zealand? They are lovely Italian citrus soft drinks designed for adults rather than children, the chinnotto is fabulous. I was hoping you would post about this one day! I knew you had done this and thank you for information on the book. I still struggle a bit with not drinking vs. drinking. I will stop for a few months and then slowly a glass of wine pops up here and there (usually starts in a social situation). I am substituting Pellegrino at night for my "cocktail" during the week and reserving champagne or wine for just the weekends should I desire. But I can see myself phasing it all out completely with time. I know I sleep better and my skin looks better if I am alcohol free. : ) Thank you for posting this! Great post. I've never been into alcohol. My thoughts were that I always immediately went to the dizzy, hungover type stage and skipped the fun stage everyone else seems to enjoy. Only a few years ago I found out I'm gluten intolerant - so that explains alot! The comment about everyone insisting you have a drink....why is that?? I've learned to quickly get something in a glass in my hand so I'm incognito! Since we live in a rural area my challenges are at cowboy type bars. Beer is out for me. A couple of "easy to communicate with the bartender" choices I've learned are asking for just the sours - basically a whiskey sour without the whiskey. Each bartender uses a combination of things to make their own sour mix. It's usually very good on its own and they'll add the fruit toothpick on top. Or - asking for whatever juice they have on hand (orange, grapefruit or cranberry here) halved with club soda. I've been making a point of doing this with any pre-teens or teenagers in my parties, too. Why not let them experience the path of different choices right away? i love sparkling water too. i've never been much of a drinker and will have maybe 2 drinks a month. but around the holidays i did let loose a little and i gained a few pounds. love your posts fiona. Hi Fiona. I was really excited to see your post on this subject this morning! My struggle is with moderation. I can't seem to just have one glass of wine. I told myself I would be very classy and only have one glass of wine at my husband's Christmas dinner for work (had 3) Same deal with Christmas Eve and Christmas Day. I know drinking is not for me either. I've been reading a blog called "unpickled" which is written by a woman our age (I'm 43 also) which is about giving up alcohol for good. Stop by there if you get a chance.-Carla. Kim, my pleasure. You are not alone! Anon, I know what you mean, I miss the 'chic' aspect of a glass of wine or champagne. But really, isn't it a lot about the glass we choose? That's why I use nice glasses for my non-alcoholic drinks now. Val, like you, I have my sweet treats in solid form rather than liquid now. Buttercream, delish. Rose, yes we do have that here. I forgot about them temporarily. The flavoured ones are lovely and tart. Thank you for the reminder. Heather, for some of us more than others, it's hard to 'manage' alcohol as you describe you are doing. I am much calmer and happier having it out of the equation altogether. Kitty, yes exactly - if you are carrying something around, no-one usually cares what it is. That's why I like a champagne flute with sparkling grape juice or similar in it. At a recent occasion, someone looked at me and my glass and said (somewhat snidely I thought) 'ooh, are you breaking your rule?'. 'What rule is that', I said innocently, knowing exactly what she meant. Why are some people like this??? Janet, sparkling water feels so much more special than still, I wonder why. Carla, I just had a look at Unpickled. She writes a serious subject matter in such a hilarious way. Thank you letting me know about it. I think for a lot of people it's hard to stop at one glass of wine. I believe it's how our body reacts to sugar/alcohol (same thing but alcohol is worse). Fiona, I gave up drinking 5 1/2 years ago for many of the same reasons. I sleep better, feel better, don't have to ever worry about driving (even one glass of wine affects me), and don't feel I have to answer that siren call of alcohol. Thank you so much for your honesty and sharing this post. It is astonishing that so many of us have the same experience with alcohol. I love wine, but no longer can tolerate it. With one glass or two, I feel terrible, sleep poorly and have "fuzzy" thinking. But it is so hard to say goodbye to something I enjoy so much. One writer had an interesting comment- that it is the glass that makes us feel chic. I appreciate the suggestions for substitutions and may try some. And I would like to add that alcohol may contribute to the chance of getting breast cancer. Another good reason to cut down or stop altogether. Fiona your post intrigued me so much I went on the Sony Australia site last night to get the ebook, then I read it before going to sleep. What a read! Thank you. Have you read Jennifer's "Lessons from Madame Chic"? Mme Chic very rarely drank alcohol for a variety of reasons. I think in the end, it's all about balance. I have to say that i'm proud to be one of the few 20 something year olds I know that isn't into alcohol. I have never been tipsy or drunk in my life and it's just been a personal preference. When I do consume alcohol, it's generally just one glass of wine and i'd better be celebrating something to drink it. I can count the amount of times I consume alcohol yearly on one hand. Fiona, I loved this post. I've never been a big drinker, but I did a similar thing this year and gave up coffee. I feel so much better for having done so, and I've saved money to boot. Now I drink herbal tea (and the rare caffeinated black or green tea) and I love it! This has caused me to think for a couple of days since you posted this. If I'm honest, I really enjoy a refreshing glass of sparkling water more than any alcoholic drink. It feels like a splurge to me. I no longer like how I feel after over indulging in alcohol. I have a drink about once or twice a month, but more and more, it's got to be something really great that I want, and not something average. There was also the experience in Paris that ruined me totally for red wine. I had the glass of a lifetime. Seriously, it was so perfect in every way and so far, everything else falls short of that one experience. I keep looking for that same perfection of flavor and it doesn't exist. All I know is that it was a St. Emillion but forgot the brand. Ah!! Fiona, this post means a lot to me. I was one who asked if you would share more in depth about your decision to not drink and I thank you! You really have me thinking and I'm inspired to try harder. I have reserved the book by Allen Carr from the library and so I should have that in my hands next week as well. Thought provoking. I'm participating in a Whole30 program for 30 days where alcohol is forbidden. I knew that not having a glass of wine would be my greatest challenge (even more than sugar and other no-no's on the plan). Ever since I was a teenager I've always enjoyed a glass of wine or a drink, even though I'm not an alcoholic. I actually liked the taste of wine, and the mellow feeling that comes with it was more a bonus. Now that I am on Day 9 of no alcohol, I can clearly see (with deep chagrin) how being "mellow" each night was interfering with my energy levels, my ability to critically think through my projects, my sleep patterns and even my physical relationship with my husband. Will I give up wine forever? No. Will I imbibe every night again? No! I like that champagne and a good, quality glass of wine will be reserved for special occasions only, like my birthday. My favorite substitute bubbly is Perrier Pink Grapefruit. So good! Thank you for sharing this. I used Allen Carr's method to quit smoking... You have inspired me.